Picture a world with fewer cars on the road. Imagine what a reduction in traffic congestion, pollution and dependence on oil that would create. Think about how that would contribute to cleaner and fresher air. Zipcar believes that by reducing the number of cars on the road, we can achieve these goals. Zipcar is a car sharing service that lets you rent a car by the hour. It’s convenient, fairly priced and downright fun. You can use a Zipcar to get around if you’ve chosen to go car-less, or even for a quick errand while your main mode of transport is being used by someone else. Did we mention Zipcars are great for the planet too? On average, each Zipcar shared takes at least 20 personally-owned vehicles off the road. Getting started with Zipcar is really easy! Just follow these 4 steps to Zipcar freedom. First, register on their website or download their app. Either method is simple, just make sure to have your driver’s license and credit card ready to go. There is a one time setup fee of $75, and each driver carries an annual fee of $25 a piece. 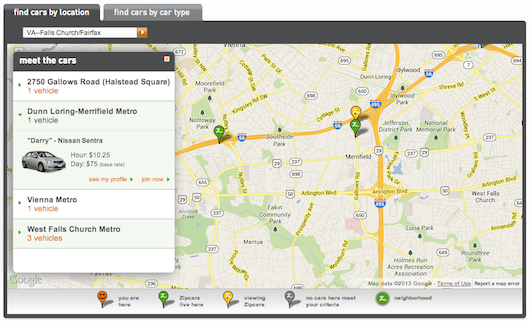 Next, use their site or app to find and reserve the car you would like to drive. Zipcar has a variety of cars for all occasions. From BMWs and Mini Coopers to Toyota Siennas and Honda CR-Vs, finding the perfect car for you is easy as one, two, three – click! After you’ve located your car, unlocking it comes next. To do this, hold your phone over a special chip on the windshield, and the doors of your new ride magically open. With car keys in the ignition waiting to be turned, you are good to go. The last step is the easiest: Start driving! If something fun and exciting comes up during your Zipcar adventure and you decide you need to drive the car longer, you can use the Zipcar app to extend your rental right from your smart phone. Best of all, they even pay for your gas. Flip up the visor in any Zipcar to find a gas card to fill up your tank. When you’re done with the car, park it where you picked it up. It’s as simple as that! At Avalon Mosaic, we’re just minutes away from several Zipcar locations. “Darry” the Nissan Sentra is currently living at the Dunn Loring-Merrield Metro stop, so zip on over and try Zipcar today!